Today I picked up the January �10 issue of the British magazine Practical Classics. 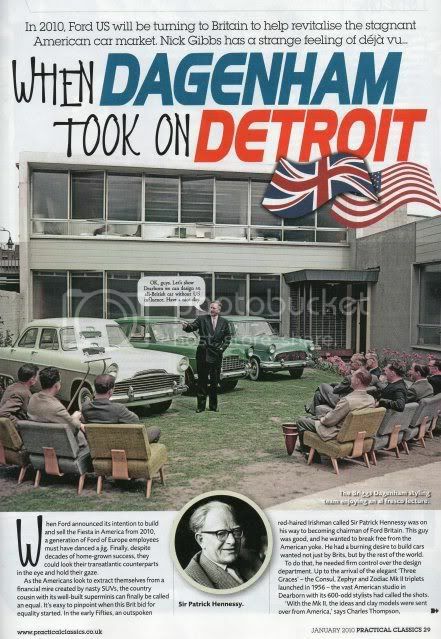 What caught my eye was the article called �When Dagenham Took on Detroit.� The title is actually bit misleading, �When Dagenham Wrestled Free of Dearborn� would have been a better title. The five page article is about the time in the mid-Fifties when Management at Ford of Britain was able to set up their own design studio, becoming much less dependent on Dearborn for �technical assistance.� Edselphiles will be interested that the article discusses Roy Brown�s brief but successful tenure as Ford of Britain�s head of design. The article suggests that Brown was sent to England as banishment for the Edsel, but that once there, he did a great job, including the Mk I Cortina. However Brown was sent packing back to the USA after making an off color remark during an interview with British TV in 1963. Jeff Koch has featured the Mk II CZZ in his "Famous Over There" column in the January 2011 issue of the Hemmings Sports & Exotic Car. He quotes me and EFONA CZZ Tech Advisor Patrick Wilson as will as gives a mention to this fourm. My May 2011 copy of Hemmings Sports & Exotic Car arrived yesterday and low and behold there is a Buyers Guide article on the Capri II. The featured car is owned by Scott LoBue of southern California -- some of you may know him or the car from Fab Fords Forever. Congratulations to EFONA member and CZZ Technical Advisor Patrick Wilson for being featured in the "Your Cars" section of the June 2011 issue of the UK magazine Practical Classics. 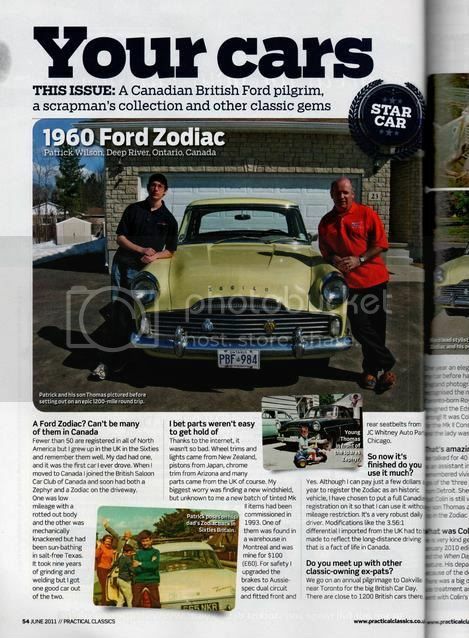 The article cover Patrick's restored Mk II Zodiac and his visit last year with retired Ford stylist Colin Neale.